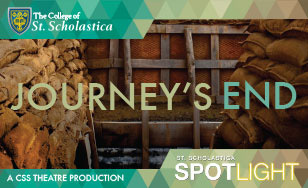 St. Scholastica's spring theatrical production is a drama set in the trenches during World War I. "Journey's End" opens at 7:30 p.m. Friday, April 13, with additional evening performances set for April 14 and April 19-21. Sunday matinees will be performed at 2 p.m. April 15 and 22. All performances will be staged in the St. Scholastica Theatre behind Tower Hall. Set in 1917, "Journey's End" tells the story of a group of British officers stationed in the trenches in World War I. Suspecting a German offensive is imminent, the officers are ordered to capture a German prisoner to acquire intelligence about the attack. The reconnaissance mission leads to some successes but also has disastrous consequences. "Journey's End" depicts the claustrophobia of the trenches, the unrelenting anxiety the men experience, and the physical, emotional, and spiritual toll of the war. It was written by English playwright R. C. Sherriff and debuted in 1928. This production commemorates the 100th anniversary of the final year of World War I, and will be directed by Kelly Mullan, a lecturer in the Communication, Theatre and Art department. Mullan said she was drawn to the story because of its larger meaning about humankind. "Even though it takes place in the trenches of World War I, ‘Journey's End' is a story about what makes us all human," Mullan said. "One of the standout lines of the show for me is Captain Stanhope saying ‘You think there's no limit to what a man can bear?' In the face of crushing circumstance, the script shines a light on the ways in which human beings connect and cope." Tickets are $15 for adults and $10 for students and seniors. For more information, contact the Spotlight Box Office at spotlight@css.edu or 218-723-7000. The College is also hosting "Cinema in the Trenches," a WWI-themed film festival on April 6-7. Details can be found at spotlight.css.edu. Additionally, there will be a lecture/recital, "Philosophy and Music after the Great War." Pianist Dr. Nick Susi will perform a left-handed concerto, "Piano Concerto in D major for the Left Hand." The piece was written by French composer Joseph Maurice Ravel for Austrian pianist Paul Wittgenstein, who lost his right arm in the war. Philosophy professor Dr. Steven Ostovich will provide a lecture about the piece of music. The recital will be at 7:30 p.m. April 20 in the Mitchell Auditorium.